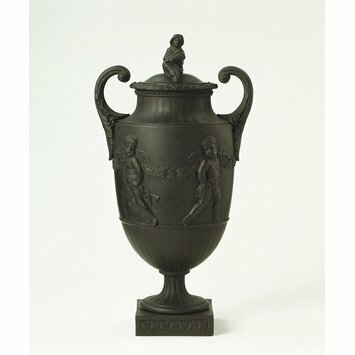 This vase was purely decorative and would have been displayed in a domestic interior, possibly on a mantelpiece, where it might have been set out with others. 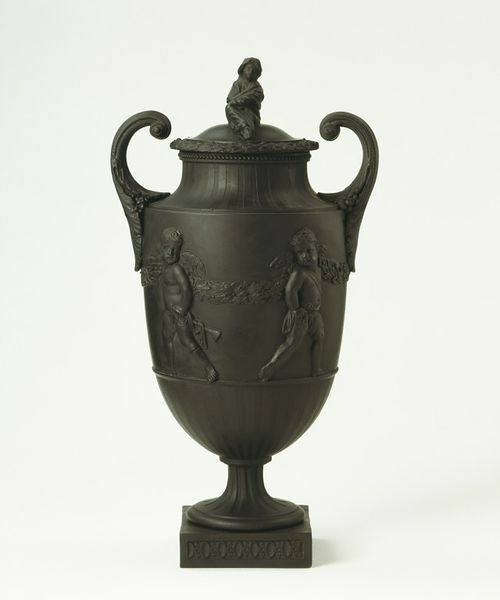 Josiah Wedgwood's move into vase production coincided with the fashionable world taking up the vase as a symbol of the new 'antique' style. The demand for 'antique' vases was so great that, in addition to copying surviving classical antiquities, manufacturers copied designs from prints of the 17th and 18th centuries. Some of these prints were highly fanciful inventions, which were not seriously intended for production. In this instance Wedgwood adapted the design from a print of vases etched by the Italian artist Stefano della Bella (1610-1664). The relief of cupids carrying a garland is adapted from a classical Roman design, one that was revived during the Renaissance: a version appears on the tomb of the Ilaria del Carretto by the early 15th-century Siennese sculptor Jacopo della Quercia. The vase is made of Black Basalt, one of several types of pottery that Wedgwood (1730-1795) introduced or refined. The black colour came from 'Carr', an oxide of iron suspended in water that had flowed through coal seams and mines.